It’s hard to remember why Joe Wilson yelled “you lie” at President Obama while he was addressing Congress in 2009 — particularly because it wasn’t true — but the issue that moved the congressman to heckle the leader of the free world was his belief that Obamacare would extend health benefits to undocumented immigrants. Four years later the question of how to address health care for people who enter the country illegally still hasn’t been settled, and now it’s become a point of contention in the latest push for immigration reform. Republicans drafting the House immigration bill are pushing a requirement that undocumented immigrants seeking citizenship be required to buy health insurance, though their colleagues say that sound suspiciously similar to the individual mandate that they’ve been railing against. 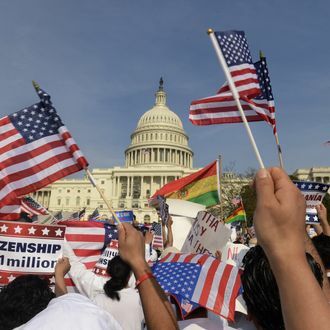 House Republicans say that if the roughly 11 million undocumented immigrants in the U.S. want to embark on the decade-long path to citizenship, they should be required to purchase their own private health care to prove that they won’t be a leeching off the government. Politico reports they’re also concerned that immigration reform might expand Obamacare, though the the Affordable Care Act already states, “Unauthorized immigrants will not be eligible for Medicaid or CHIP coverage or for exchange subsidies under the ACA and will not be permitted to purchase unsubsidized coverage through the exchange.” Under the Senate’s immigration bill, those on the path to citizenship still wouldn’t receive subsidies, but they would be allowed to purchase a policy through an exchange using their own money. Some conservative groups argue that the House Republicans’ plan will be perceived as a massive flip-flop. “It’s totally reasonable to make sure you don’t expand the welfare state, but there’s no need to do that by imposing a discredited, Obama-style individual mandate,” said said Alex Nowrasteh of the Cato Institute. “I think it’s such a glaring and obvious contradiction that they’ll have to drop it.” However, those supporting the measure counter that voters will understand that it’s okay to make rules for undocumented immigrants that they find totally unacceptable for U.S. citizens. Democrats oppose the measure, arguing that private insurance is far too expensive for many undocumented immigrants. “You can’t ask somebody to buy something they can’t afford, then deny them the ability to get any help,” says Rep. Henry Waxman. Technically lawmakers could do that; the question is whether they’re willing to be that harsh on undocumented immigrants seeking citizenship.